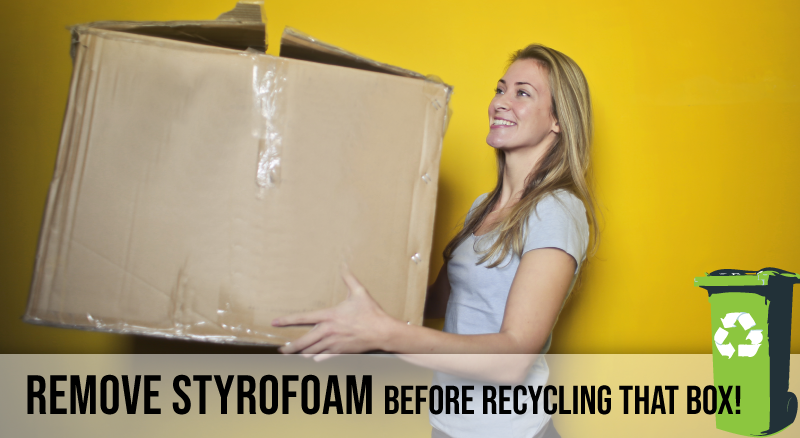 Millennium Recycling Styrofoam: In a box? Styrofoam is NOT recyclable in Sioux Falls, even if it’s inside your cardboard box. We receive lots of cardboard boxes for recycling. Along with boxes, we also see a lot of packaging material left inside: plastic wrap, packaging bubbles and styrofoam. Plastic wrap and packaging bubbles should be removed from the box. The other material that people leave in the boxes is the biggest problem: Styrofoam. This squeaky, messy material also known as expanded polystyrene is NOT recyclable in Sioux Falls. Please make sure you remove it from your box before recycling. Plastics are not all created equal and some of them, like Styrofoam, don’t make economic sense to recycle. So what’s the issue with items like coffee cups, to-go containers or packing peanuts? Material recovery facilities like Millennium can only process items that have a demand in the marketplace that cover the costs of collection, processing, and transportation. More than 95% of styrofoam is just air, which means it takes up a lot of space, weighs very little, and yields a tiny amount of material when processed – This makes the logistics of trying to collect it and move it very difficult. There is also no reliable market that currently exists for styrofoam. Some studies have concluded that there are no effective or efficient ways to recycle styrofoam due to the low market value of the material and the high rate of food contamination. So what can you do with styrofoam? REUSE: Packing peanuts can be used to store your valuables or be kept for future shipments. You can also donate them to UPS or other shipping stores who may reuse them. Call the automated Peanut Hot line at 800-828-2214 to find a site near you that will accept them. MAIL-IN PROGRAMS: Mail-back programs such as the Alliance of Foam Packaging Recyclers are available. Just make sure to remove all debris, tape and labels from the material before breaking it into smaller pieces to fit into a box for shipping. Have something else you’re not sure about? Use our Where Do I Take This tool to search the database of local places you can recycle almost anything. If you don’t see what you’re looking for, just ask us! We love to hear your questions and if it’s not listed in our database, your questions help us add it to the list for others to see. There are 0 comment. on "Styrofoam: In a box?"